The BlackBerry 10 OS launch is fast approaching and we already got to learn the specs of RIM's upcoming BlackBerry L-Series phone. 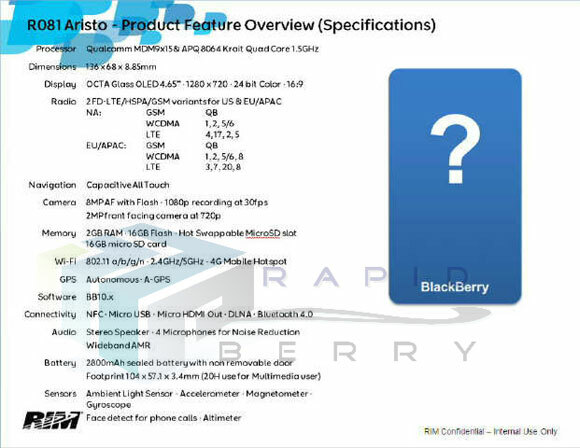 Turns out, there's a much more interesting device in the pipeline dubbed the BlackBerry 10 Aristo. Revealed in a leaked specifications slide, the Aristo (Greek for "the best") is rocking some serious processing power under the hood and, if the info is trustworthy, this is set to be quite the beast. The BlackBerry Aristo is powered by a Qualcomm APQ8064 quad-core Krait processor running at 1.5GHz coupled with 2GB of RAM. The smartphone also impresses with a 4.65-inch OLED display of HD resolution. The screen is said to use OCTA Glass made by Samsung, which eliminates an additional touch screen layer and integrates the touch sensor directly onto the AMOLED panel instead. As a result, the BlackBerry 10 Aristo will measure just 8.85mm thick. It's not the thinnest device out there, but it's certainly the slimmest in RIM's portfolio. Connectivity is reportedly going to be pretty solid as well with NFC, Bluetooth 4.0, microHDMI out, Wi-Fi Direct, DLNA and microUSB. Above the display stands a 2MP front-facing camera capable of shooting 720p video, while at the back the Aristo will make use of an 8MP snapper with auto focus and LED flash. Naturally, it will have no problems shooting 1080p at 30fps. There's 16GB of internal storage, which is expandable thanks to the microSD card slot. The leaked slide also suggests a beefy (but non-removable) 2,800mAh battery. If the slide hasn't been faked, we might be looking at a device well suited to start RIM's fightback.